I often thank my stars for leading me to fantasy fiction because nothing can be more exciting than living in a whole new world full of the most interesting people. I discovered The Mortal Instruments through YouTube where a lot of book bloggers spoke about this series. Bookstagram too pushed me a lot towards this series so I couldn’t wait to get my hands on it. I saved money to buy the whole set but then I remembered my struggle with The Lunar Chronicles (yeah….still trying my best to finish Winter) and the Six of Crows series (250 pages down and I still don’t know what exactly is happening in the book) and thought I must not risk buying another new series without reading the first book. After searching through a lot of libraries I finally found one that would rent The Mortal Instrument series. And though the first book, City of Bones did not impress me a lot, I am still excited for the next book as I am sold to this new fantasy world. 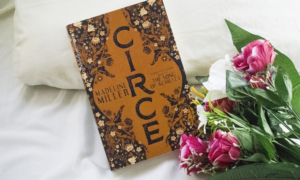 Fifteen-year-old Clary Fray’s world comes to a halt when she learns that her mother has been kidnapped and probably murdered. In such a situation, she has no other option but to turn to Jace Wayland, and his comrades Isabelle and Alec, who she saw killing a weird creature the previous night. After befriending Jace she discovers that she is a Shadowhunter who is born to kill demons. She also learns that her mother too was a Shadowhunter and is currently held captive by Valentine who is the leader of a rebellious group that was formed to produce more Shadowhunters using the Mortal Cup. Valentine knows that Clary’s mother, Jocelyn has stolen the Mortal Cup and will not leave her till she hands it over to him. Clary wants her mother back and will do anything to see her safe. But how will she reach the evil Valentine who is currently in hiding? Will Jace and his friends help her in her quest? …I loved the writing. After feeling completely lost with Six of Crows I realised how important lucid language is for a fantasy fiction reader. I am struggling with Six of Crows because I just cannot grasp the writers’ writing. Whereas, author Cassandra Clare has built her complex world with such ease and simplicity that I feel like I am a part of it. Imagining the ugly demons or the silent bony brothers or even the scary Downworlder was easy because Clare drew these characters with her words. Creating a new world and making your readers see what they have never seen before is an art and Clare is quite a master at it. …I want to dwell in Clary’s world. I know her world is not a very pleasant or easy place to live in but I still loved everything about it. This imaginary world that Clare has built is marvellous. Even though I was not super impressed by this book I was totally sucked into this world and I am looking forward to reading the next book because I want to know more about this world. …I felt there was something missing in it. I cannot pinpoint what was missing but I did not feel ‘wowed’ by the book. The story was thrilling, the characters were cool, the set-up was exciting but I still did not feel that contentment I usually feel when I finish a book that I loved. I am not saying that I did not like the book. The book is just AWESOME but not as awesome as I imagined it to be. Perhaps I am feeling this because of the big twist towards the end that left me feeling let down. I am sure (fingers crossed) that things will change later but the final revelation in the end kinda broke my heart as that was the last thing I would expect in any novel. But I am hopeful that this is just some kind of a misunderstanding and that everything will be fine soon. “Do you remember back at the hotel when you promised that if we lived, you’d get dressed up in a nurse’s outfit and give me a sponge bath?” asked Jace. “As soon as I’m back on my feet, handsome,” said Simon. Final View: City of Bones (The Mortal Instruments Book 1) is an exhilarating experience in a brand new world with scary demons and hot Shadowhunters. If you are a hard-core fantasy lover, you will not want to miss this one.